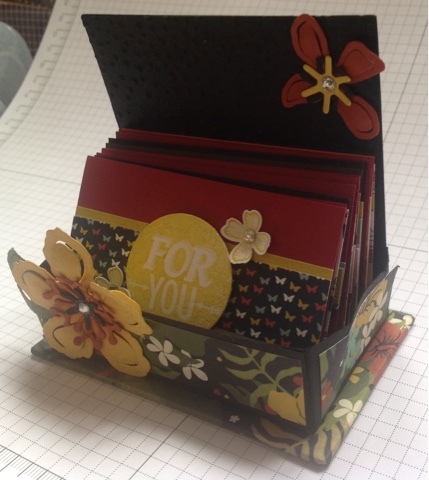 Here are some of my handmade Business cards and Business card holder project that I shared at our Stampin' Up! Team meeting today, updating with the Botanical Blooms theme. I designed the box around a swap I received from a fellow demonstrator Jo, in 2014, but resized larger to meet my requirements and then decorated with new current products, for a completely new look. This bundle is one of my favourites in the current catalogue. 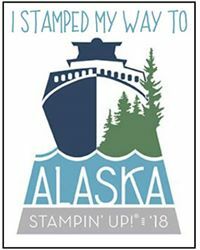 For those of you familiar with Stampin' Up! bundles at 15% discount, this is even better as it includes the stamp set, co-ordinating Framelits AND the co-ordinating Designer Series Paper for really great value. 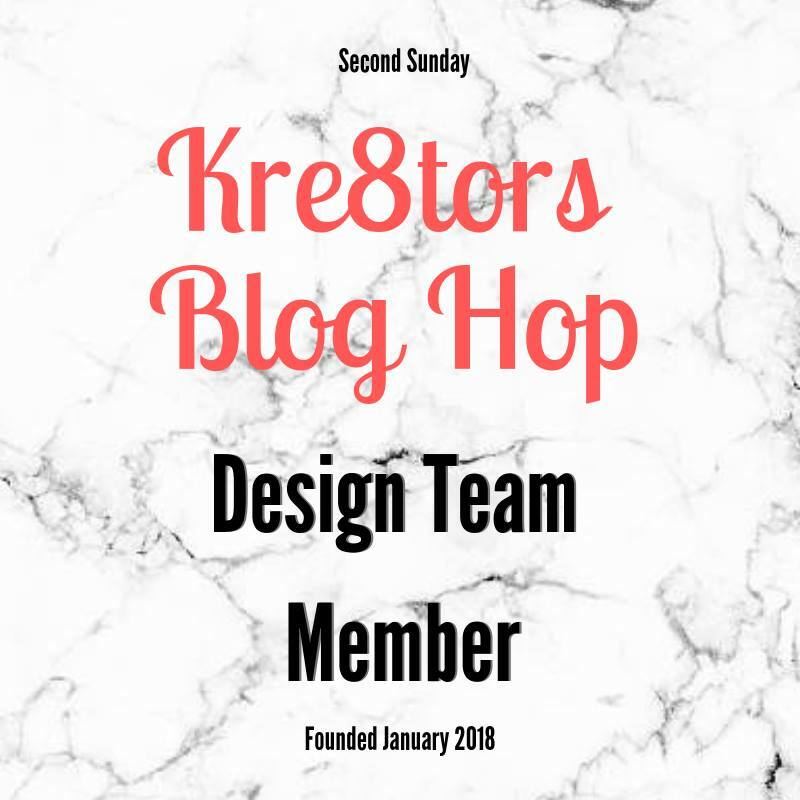 This was my project share for everyone to make and everyone had their own pre-cut kit to create their own business card holder, with a few blank cards to get them started. You may have seen earlier this year, how I've been using up scraps lying on my craft desk, to make handmade Business cards. 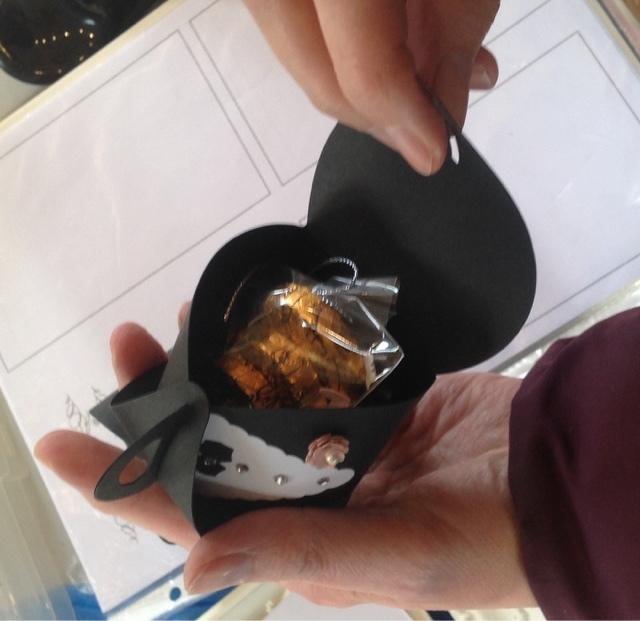 Handmade also means layers and decoration and therefore 3D are much thicker than standard bought Business cards. Today my dear friend and 'adopted' Mum Pat, visited me at my Studio for help finishing some more of her grandson's wedding stationery. On previous visits we had a marathon die-cutting session with the Curvy Keepsake die from Stampin' Up! It is amazing all the different cute boxes that can be created with this set. 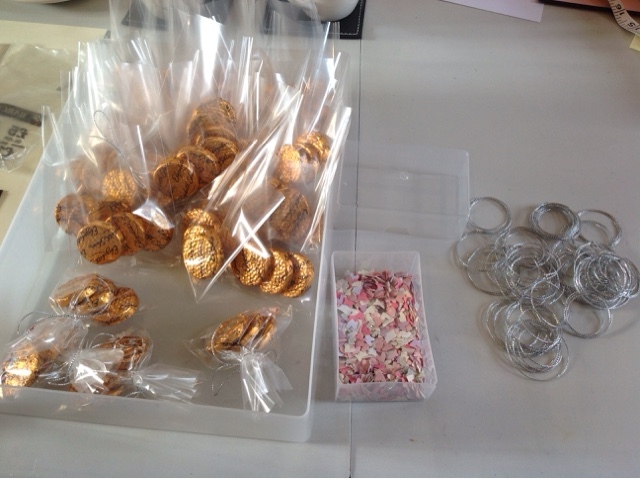 Today we filled Boxes with a mini cello bag containing 3 Elizabeth Shaw mints with a small 'pinch' of homemade confetti. This was hand-tied with retired Silver cord trim and popped inside each box. Boxes for children were filled with jelly beans. 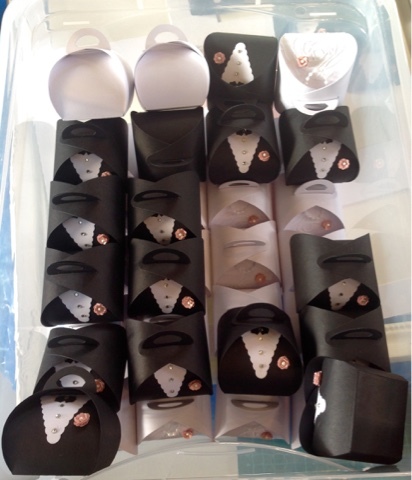 Place names have been typed and punched with retired Decorative Label punch to stand neatly between the two handles, as wedding favour place settings. We made good progress on the wedding seating plan but Pat is coming back on Friday to finish. With the wedding just over 2 weeks away, we have given ourselves a deadline of this Friday. 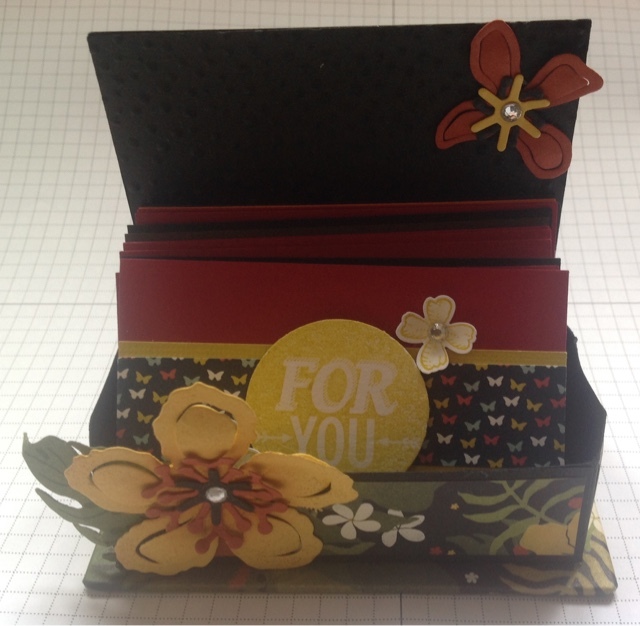 The theme set for February's monthly online Demo swaps was to create either an Easter or a Mothers Day card. The organiser posted our swaps in the mail today, so I can't wait to receive mine in the next few days. 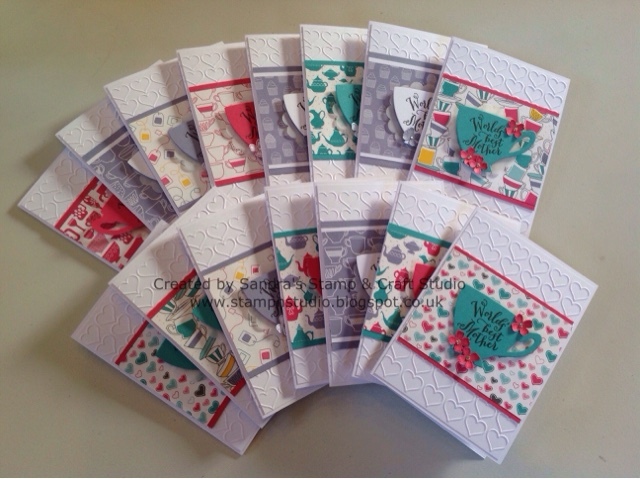 My cards were made using A Nice Cuppa stamp set and co-ordinating Cups & Kettle Framelits Dies. 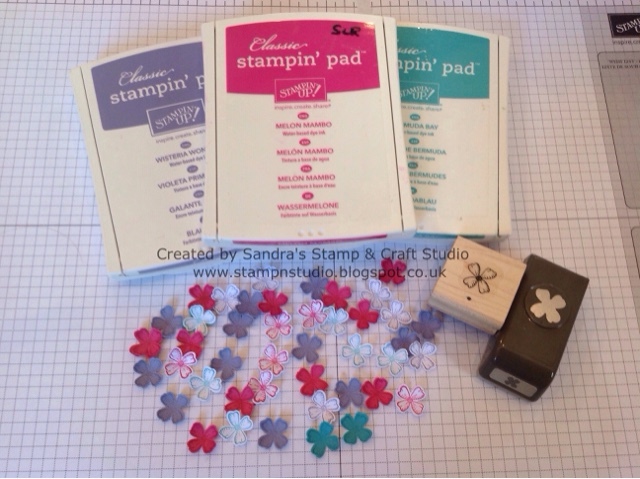 Another great offer from Stampin' Up!, saving 15% buying both together as a bundle. 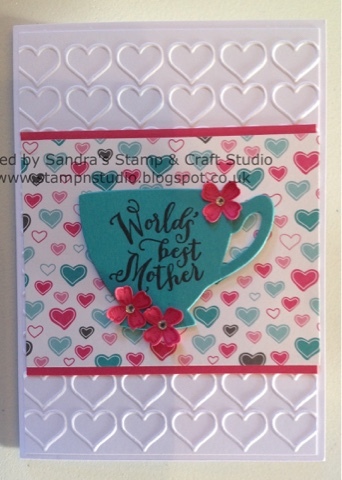 Look at the gorgeous Happy Heart Embossed background. A classic tale many crafters can relate to ......a new product I had bought but not yet used. ..... And I love, love, love these little flowers from the Itty Bitty Punch Pack. Used with the Something To Say stamp set, they look even more cute. Some were stamped in the same ink as card for a watermark effect, others were stamped onto white card. As the Designer Series Papers are all different, my set up of cards varied. Sale-A-Bration continues through until 31st March, with every £45 spent you get to choose one FREE product. It's the perfect time to purchase products you've had your eye on, while earning more for FREE ! Click on images below to link straight to more product information. 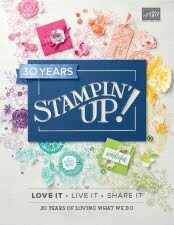 You will also be able to order online and Stampin' Up! will deliver direct to your door. Remember to quote this months HOSTESS CODE is ~ FWGVFWRF. Today I'm sharing a few of my customer thank you notes for some recent orders, with another batch cut ready to stamp before the next two boxes arrive this week. Here I used Sahara Sand card for card bases cut to 14cm x 7cm, added a 6cm square of Black card then stamped images from Grateful Bunch stamp and punch bundle with Daffodil Delight ink pad onto Whisper White card, to create this selection of notelets. Remember that until 31st March, for every £45 you spend, you get to choose one FREE product. It's the perfect time to purchase products you've had your eye on, while earning more for free !